Guatemala is situated between Mexico to the north and El Salvador and Honduras to the south. There is coastline on the Pacific Ocean and the Caribbean Sea. It is truly a beautiful country. The landscape is spectacular. Tranquil lakes, rivers and majestic volcanoes cover the countryside. The diet is basic and not very nutritious. The staple food is corn. The daily diet includes tortillas (flat corn pancakes), black beans, rice, herbs, and hot chili peppers. Meat, milk and eggs are rarely eaten. Families make a living working in the cornfield, planting two crops a year. If no irrigation system exists, only one harvest per year is possible. 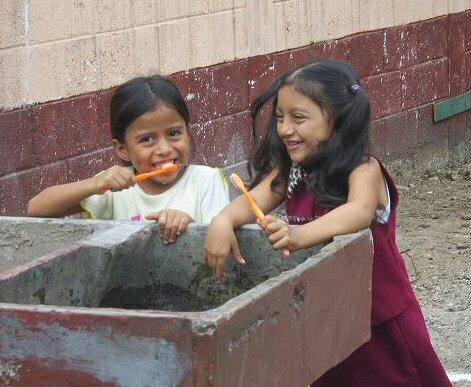 The sewage system is usually inadequate for most rural Guatemalan communities. In many areas, wastewater runs down small canals on the sides of the houses. The majority of homes have latrines. The lack of a drainage system causes rivers in the streets during rainy season. The absence of infrastructure leads to a high incidence of gastrointestinal and respiratory illnesses in children. There is often only one ill-equipped health post in each community. A nurse usually attends to the entire population. For serious illnesses, people must travel several miles to a hospital in Guatemala City. Despite all of this, people are friendly and sincere. They are happy people in their humble surroundings. The common dental problems seen by us were chronically infected teeth in both adults and children. The story always seemed to unfold in the same manner. Small cavities started undetected. These progressed unnoticed until they caused a severe toothache. Still unable to afford basic dental care, most people simply put up with the pain until the tooth died. The pain often subsided to a low-level ache. Many just accepted this discomfort without realizing that infection persisted in their jaws. Contaminated food and drink are the major sources of stomach or intestinal illness while traveling. CDC makes no recommendation as to the use of any of the portable filters on the market due to lack of independently verified results of their efficacy. Diseases do exist in Guatemala. Certain precautions must be taken to guard one's health. The following information is taken from reliable sources including Center For Disease Control and the World Health Organization. However, it is essential to consult a physician for individual circumstances. Please note that recommendations will change. The following vaccines/prophylaxis are often essential for travel in Guatemala, especially for health-care workers. • Anti-malarial medication in risk areas*. Recommended: chloroquine. See your doctor at least 4-6 weeks before your trip to allow time for immunizations to take effect.